Stone Liberty Station will be a 20,000 sq. ft., 400-seat brewery/restaurant complete with bocce courts and an outdoor movie area. The new brewery/restaurant will have a 10-barrel brewing system, provide 130 new jobs, and is expected to open in late spring 2012. 40 taps, emphasizing local brands, will complement a ~100 ct. bottle list. During our weekend in Brussels we missed out on some sites like Cantillon Brewery, but we managed to hit Bier Circus before it closed Saturday night. The food was pretty good, but it was the beer selection we came for. We poured through their beer menu and had some lovely selections over the course of the meal and evening. While their regular menu is impressive enough, we also paid a god awful sum to try an off menu choice, Westvleteren 12. That name doesn’t mean much to most people. Westvleteren is one of only seven Trappist breweries in the world. The others you may recognize – Chimay, Orval, Rochefort, Westmalle, Achel, and Koningshoeven (aka La Trappe). All are well known for their excellent beer. The critical difference with Westvleteren is that unlike the other monasteries, it has no interest in producing commercial quantities of beer. Westvleteren only brews enough beer to cover monastery costs, no more, regardless of demand. People have to call in to the abbey in advance to make a reservation on a particular day to pickup a case of beer (and no more than a case). Given the rarity of the beer, it has produced a bit of an obsession in the beer world and has consistently ranked one of, if not the best, beer in the world. The “best” just seems silly to me. Ranking is such a strange concept when applied to intangibles and variances. A prime example is travel. When someone asks me “what has been your favorite place to travel to”, I honestly don’t have an answer. I’ve love to return to any of them; each brought a difference experience to the table. I feel the same way about *the best* food or drink. Is the Westvleteren 12 an excellent beer? Definitely. The best? It doesn’t matter. I’m just as happy with a St. Bernardus Abt 12 or Trappistes Rochefort 10. Perhaps that’s for the best. Scarcity and expense have an impact on our perception of how much we think we will like something. But research shows it doesn’t work out that way – we frequently like the cheaper stuff better. Anna and I were down near the border for some shopping and had a hankering for tacos. I used yelp on my phone to see what looked interesting near by. Surrounded by mall land I wasn’t optimistic. 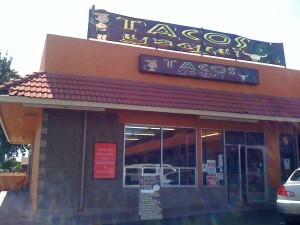 One taco shop with only three reviews sounded pretty good – Tacos Yaqui (111 W Olive Dr, San Ysidro, CA 92173). They are trying to emulate the places in Baja, and they do a pretty good job of it. These are bigger than street tacos, and a combo is very filling. Anna and I had the Tacos Perrones (carne asada) and Tacos Norteños (spicy shrimp). Both were excellent – some of the best tacos I’ve had in a while. If you are near the border but not crossing it, definitely look them up. I’m not much of a steak guy these days. In fact I am usually more likely to order veggie than meat. We spent the night in Chicago yesterday and decided to head out for a good steak in a city that knows steak and steakhouses. I had a 55 day aged beauty of a ribeye and truffle fries at David Burke’s Primehouse. It was the best steak I’ve ever had – buttery, interesting and savory. Aged, cooked, and seasoned perfectly. It was really interesting to see how many different flavors came through after the aging. I don’t plan to make steaks a regular part of my diet, but it was definitely worth doing it right. I popped into the newly opened Halcyon Tea in South Park yesterday evening. The shop is located just a couple doors up from what used to be Santos, and a short block from Grant’s Marketplace. They have done a nice job fixing the shop up and it looks great. Their tea selection is pretty good, prices reasonable, and they are happy to let you stick your nose in the big metal jars to check out different teas. I picked up some of my staples and tried out a new oolong. So far, I’m a fan. I wish them the best – opening a tea shop in a recession is not for the faint of heart.